The dictionary lists definitions of “an exceptionally long and arduous task or activity… heroic or grand in scale or character,” or “a long film, book, or other work portraying heroic deeds and adventures or covering an extended period of time.” The intrinsic value and meaning of the word was lost for me amidst its overuse and popularity, so it mostly receded from my vocabulary save the occasional reference to my beautiful Specialized mountain bike. I would cringe a little when friends tried to pump up their stories and references with its use, as I have always believed duration and intensity were essential elements of a true epic. Fast forward a few years into my pro triathlon career, and I have done quite a few crazy training days and plenty of Ironman races. I’ve also had my fair share of accidental and misjudged adventures that left me shivering overnight on a mountainside, or trudging through the cold and dark to the trailhead after getting lost and miscalculating just about every element of a climb. However, I had never completed anything more than 3 consecutive days of intense racing on my bike, let alone 8. 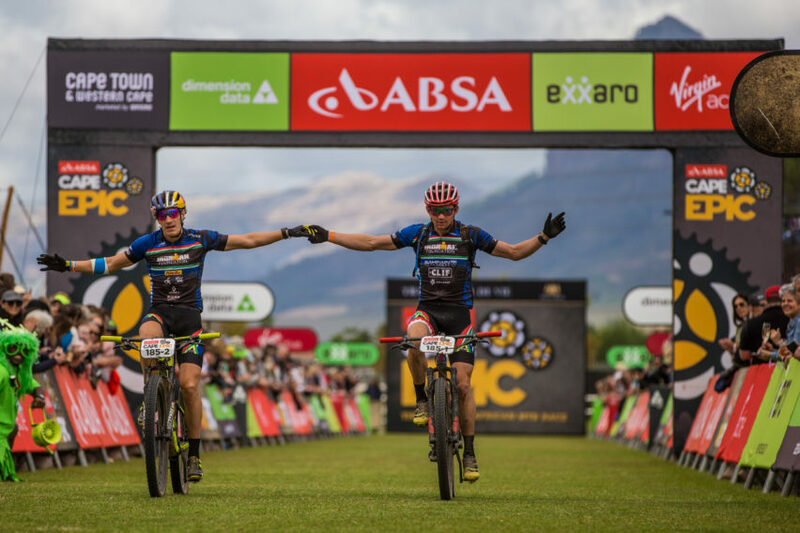 When I was offered an opportunity to race The Cape Epic for the Ironman Foundation, I suspected that it would be challenging, but perhaps subconsciously doubted whether it was really “epic.” I happily said yes; IMF is a great cause and I could use a little excitement in my training. I began learning and preparing for the event with the belief that it would be no more difficult than the hard training I subjected myself to for Ironman racing. After a few months of preparation in Arizona, I boarded flights for South Africa to tackle the famed event. I began the journey with confidence and excitement for the new challenge. My partner, Sebastian Kienle, and I prepared for the prologue, a short and sweet 20k/600m climbing affair that would help seed us for the following days. Unfortunately for us, our stomachs were feeling a little off a day before the event got underway, but we put on brave faces and assumed we would recover quickly during the week ahead. The prologue went well and we were underway, but the faint whispers of uncertainty and concern were already sounding somewhere in the background. Day 2 came and went, but not without some eye-opening experiences. The stomach bug worsened for both of us and made nutrition and hydration more challenging. Sebi also had a heavy fall in the opening kilometers of the stage which could have easily broken bones. We survived and finished in a good position, but with looks of worry discernible through our dusty veils. Still, there was optimism and hope in the early days, and we kept pushing forward, convinced that this was at a minimum teaching us to be better at suffering. And suffer we did. It would only get harder for us, and the following days were like living a bad dream. One one hand we felt sheepish about discussing our small mishaps and crashes because it almost felt like doing a disservice to the “real” misfortunes of other athletes breaking bones, bikes, and spirits as they DNF’ed the race. After all, we were still racing, but we were both struggling with injuries from our own crashes, the GI distress, and the cumulative mental and physical fatigue from the punishing event. With many endurance sports, injuries can be seen almost as a badge of courage and toughness, of hard work, but perhaps these had gone a step beyond, and we often gave each other solemn and uneasy glances. Even off the bike the nervousness pervaded our thoughts and discussions, as the concept of relaxing disappeared amidst the fear of tomorrow’s certain punishment and potential for catastrophic consequences. We discussed quitting, as our careers were in Ironman, not mountain bike endurance racing, but we felt the need to finish what we started and honor the charitable elements of our race for Ironman Foundation. Looking back now, our desire to continue probably also sprung from an innate curiosity to test our limits of endurance, free of the usual rationale that governs much of our daily routines. We were both liberated and trapped by our passion for exploring the brink. Over the next several days, there were moments of hazy delusion when my mind drifted and began personifying stones so I could curse them as if they had a deliberate agenda to cause me annoyance and harm. It was a feeling of holding your breath all day; an almost constant apprehension and growing distrust of my skillset to handle the unrelenting obstacles and accumulating fatigue. Apprehension and doubt were prevalent in virtually all elements of our day, and I understood that I could both love and hate my partner simultaneously as we pressed into the unknown. I posted on social media, but there was a clear reduction in the cheerful and polished content that would often appear in my timeline. I did not eat or sleep enough or on my normal schedules, and I retreated deeper into my own mind. George Harrison had taught me that “all things must pass,” but I began to question the soundness of his proclamation. However, and finally, the end of the road quite literally came, and we were across the finish line. The 8 days possessed a strange infiniteness; peculiar by the absolute and unusual degree of struggle, and through the uncharted exploration of the margins of our mental, physical, and emotional stamina. Even in that moment of relief, our sense of elation and accomplishment was restrained, probably due to sheer exhaustion and having been removed from those more “positive” emotions for over a week. We had completed one of the most demanding challenges of our careers, and it was time to absorb the lessons and recover, to recount stories and shake our heads in disbelief at the sheer expenditure. I had come for a new experience, to adjust my perspective on discomfort, to feel alive, and I can tell you, it was epic. Interested in learning about how you can #raceformore with the Ironman Foundation? Check out their website http://ironmanfoundation.org and join us in making an impact and racing for those who can not.